The DCI Development Board of Advisors assists Duke Cancer Institute in its mission to harness breakthrough discoveries that drive global advances in treatments and cures. Board members support Duke Cancer Institute as knowledgeable advocates, passionate ambassadors and generous donors. DCI Development Board members help in identifying and cultivating both financial and non-financial resources necessary to achieve the specific objectives in the strategic plan and new initiatives as they emerge. To learn about the nomination process for the Board of Advisors, contact the Development Office at 919.385.3120. 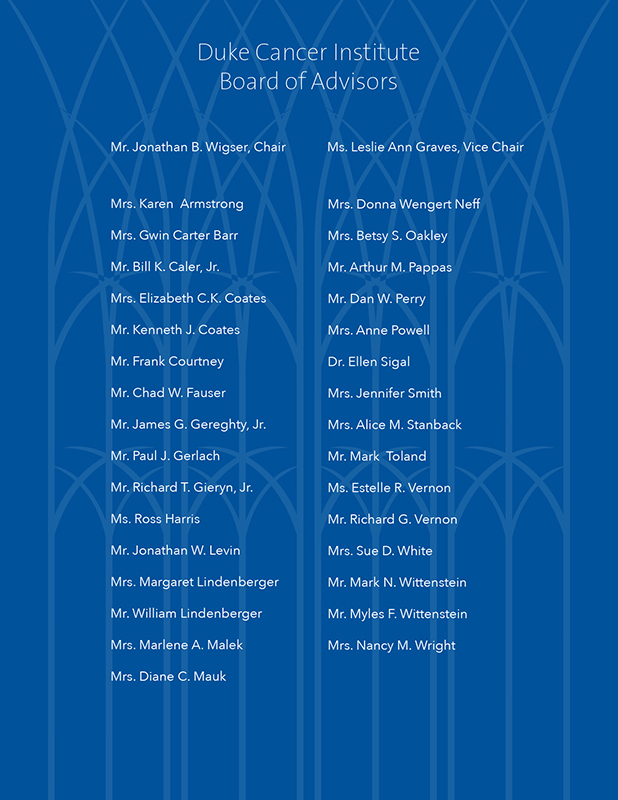 Download Duke Cancer Institute Board of Advisors list.